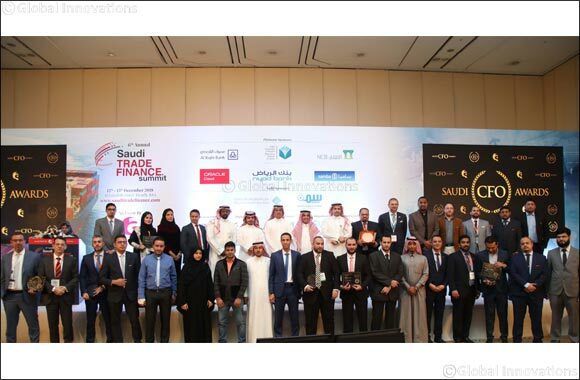 Riyadh, Saudi Arabia, December 17, 2018: Held alongside the 6th Annual Saudi Trade Finance Summit, organized by QNA International, at the Al Faisaliah Hotel in Riyadh, the second day witnessed the recognizing and awarding of great finance leadership and initiatives supporting the vision and innovation of the finance leaders in the Kingdom for fulfilling key strategies in line with Saudi Vision 2030. The event highlighted, honored and celebrated path breaking achievements of public & private sector organizations and individuals who have contributed significantly to achieving the Kingdom’s Vision through sustainable growth. “The Saudi CFO Awards recognizes finance leaders of public & private sector organizations and individuals for outstanding performance and leadership. The Saudi CFO Awards was initiated to support the vision and innovation of the finance leaders, while setting a benchmark in the Kingdom for fulfilling key strategies in line with Saudi Vision 2030.’’ said Sidh NC, Director, QNA International. Recognizing the potential and contribution of exemplary achievement towards the Arab World’s largest economy was at the forefront of the Saudi CFO Awards 2018.